Even with all the stylists that money can buy, a star will STILL step out in a questionable outfit now and again—one that has everyone wondering “What were they thinking? !”Here are some of those memorable moments that have yet to be explained… 20 Stars Biggest Fashion Mistakes. Lady Gaga had her mind on jerky when she debuted her notorious meat dress. Aubrey O’Day was probably just wondering what it would look like if you turned an UGG boot inside out and then wore it as a dress. Katy Perry wasn’t thinking about the kids when she wore this PG-13 outfit. 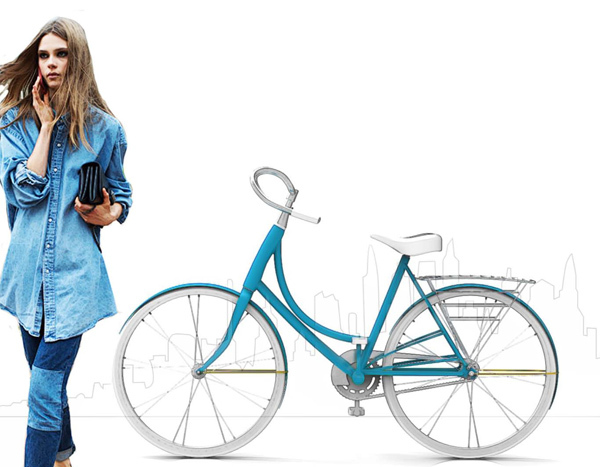 Kristen Stewart just won’t chuck her Converse. Rose McGowan shocked at the 1998 VMAs, her outfit literally hanging by a few threads. Lil’ Kim was drowning in this sea of purple. 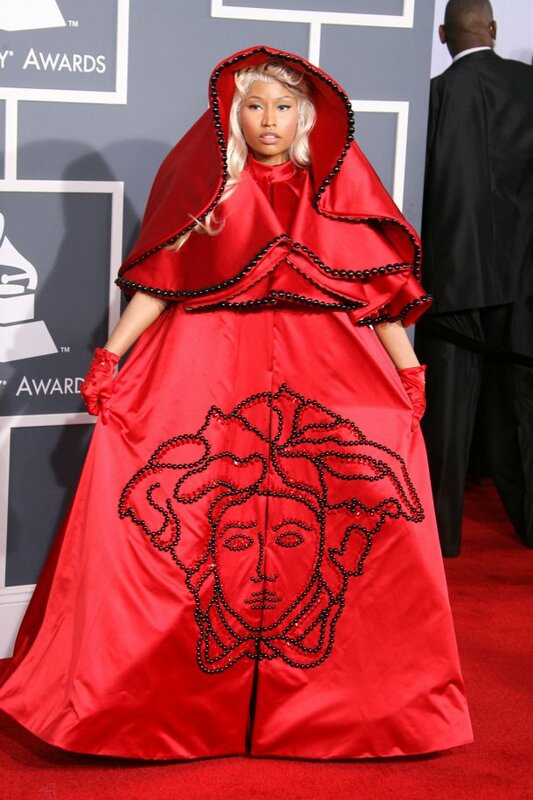 Nicki Minaj is a one-woman Vatican City. Jennifer Lopez looks like she ran through the feathers section of a Jo-Ann’s before accepting her Golden Globe. Snooki lives in her own dreamland where she’s royalty. Taylor Momsen left “Gossip Girl” to finish her shift at Hot Topic. What was Eva Longoria thinking leaving her house without pants? Christina Aguilera was probably going for something heavy and edgy here. This is what happens when you want to leave the house in a doily. 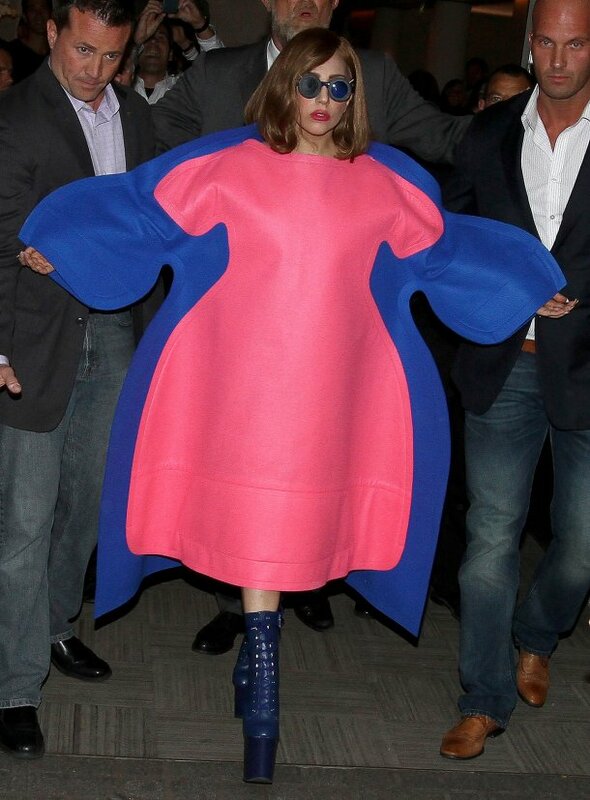 Lady Gaga being whisked away in this puffy Comme Des Garcons. Nicki Minaj was thinking multiple things here: train conductor, cake icing, cotton candy hair, a plush velvet couch. Bjork stole the entire Oscars ceremony with her swan dress. It even has its own Wikipedia page. Rita Ora might want to take a course on gardening. There are plastic bags from “American Beauty” (“It’s so beautiful…”) and then there are plastic bags that Ke$ha wears to awards shows. Kim Kardashian tried to make a surrealist statement in this floral optical illusion.